A group leaves Hilltop to make their way to the fair at the Kingdom, however, they are attacked and killed by the Whisperers and Alpha is shown scalping one of the women. The fair goes off without a hitch as everyone comes together in celebration. Daryl arrives with Henry, Lydia, Connie Michonne and Judith. Carol and Ezekial are surprised but happy to see Michonne and Judith as they have not seen each other in years. The leaders of the community leaders of Alexandria, the Kingdom, Hilltop, and Oceanside meet and decide to unify once again as they all sign Ezekial's scroll. While everyone enjoys the fair, Lydia finds it difficult to fit in and is bullied by the other kids she meets. Henry tracks her down and comforts her. Alpha, using the scalped woman's hair and clothing as a disguise infiltrates the Kingdom to learn more about the community and way of life. The community gathers in the theater to watch a movie, however, Lydia is obviously on edge. As soon as she lets her guard down and tries to enjoy herself, Alpha reveals herself sitting right next to her. Outside the two argue as Alpha wants to bring her home but Lydia insists that she doesn't want to return to the Whisperers. Lydia begs her mother to leave in fear of her being killed if anyone sees her. Alpha reluctantly leaves. 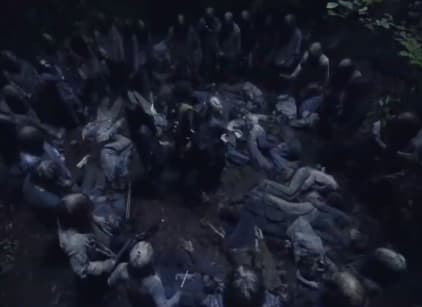 Following the fair, Daryl, Michonne, Carol, and Yumiko head to defend Hilltop against a possible Whisperer retaliation, however, the group walks into a trap set by Alpha and are surrounded. Alpha wishes to speak with Daryl alone and leads him to the top of a quarry where it's revealed to hold thousands of walkers. Alpha warns that if Daryl's people ever cross into her land, she will unleash her horde into theirs. She tells Daryl that she marked the border that should never be crossed and will see it as they leave. Alpha tells Daryl that Lydia will be safer with his group and she hopes that she can protect her the way she couldn't. As they are allowed to leave, Daryl, Michonne, Carol, and Yumiko find an injured Siddiq who leads them to the border which is revealed to be pikes with the decapitated and reanimated heads of Ozzy, Alek, DJ, Rodney, Addy, Tammy, Tara, and Enid. Carol and Daryl are horrified to find that the last head is of Henry. Back at the Kingdom, Siddiq speaks to the community about the incredible loss. He states that he was left alive in order to get the Whisperers message across, but instead tells them that they all fought valiantly until the very end and that is what should be remembered. Alpha is seen emotional and crying over the loss of her daughter, however another Whisperer sees this and Alpha immediately kills him to prevent anyone else finding out. Sometime later, Lydia and Daryl visit the Whisperer border, however, the heads have since been removed. Lydia lays her necklace at the base of Henry's pike as snow begins to fall.